"A deeply moving account of courage and wisdom, shared by an inveterate mentor looking into the multitextured face of his own death. There is much to be learned by sitting in on this final class." "All of the saints and Buddhas have taught us that wisdom and compassion are one. 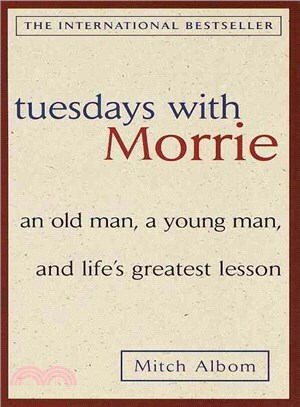 Now along comes Morrie, who makes it perfectly plain. His living and dying show us the way." Afterward, I find Morrie Schwartz, my favorite professor, and introduce him to my parents. He is a small man who takes small steps, as if a strong wind could, at any time, whisk him up into the clouds. In his graduation day robe, he looks like a cross between a biblical prophet and a Christmas elf. He has sparkling blue-green eyes, thinning silver hair that spills onto his forehead, big ears, a triangular nose, and tufts of graying eyebrows. Although his teeth are crooked and his lower ones are slanted back-as if someone had once punched them in-when he smiles it's as if you'd just told him the first joke on earth. He began to see doctors. Lots of them. They tested his blood. They tested his urine. They put a scope up his rear end and looked inside his intestines. Finally, when nothing could be found, one doctor ordered a muscle biopsy, taking a small piece out of Morrie's calf. The lab report came back suggesting a neurological problem, and Morrie was brought in for yet another series of tests. In one of those tests, he sat in a special seat as they zapped him with electrical current-an electric chair, of sorts-and studied his neurological responses. He went for his regular swim at the YMCA, but found he could no longer undress himself. So he hired his first home care worker-a theology student named Tony-who helped him in and out of the pool, and in and out of his bathing suit. In the locker room, the other swimmers pretended not to stare. They stared anyhow. That was the end of his privacy. In fact, he entertained a growing stream of visitors. He had discussion groups about dying, what it really meant, how societies had always been afraid of it without necessarily understanding it. He told his friends that if they really wanted to help him, they would treat him not with sympathy but with visits, phone calls, a sharing of their problems-the way they had always shared their problems, because Morrie had always been a wonderful listener.